Sie lebt Buchstaben und beschäftigt sie sich mit Themen wie Dekolonialisierung, Traum(a), Selbst_Liebe, Intersektionalität, Heilung, Privilegien, Identität_en und ganz besonders warmes Erdbeereis. Stefanie-Lahya Aukongo wird am 29. Oktober bei der Podiumsdiskussion 5 sprechen: Deutsch, ABER mit Migrationshintergrund. Lahya (Stefanie-Lahya Aukongo) is a black intersectional freelancer. 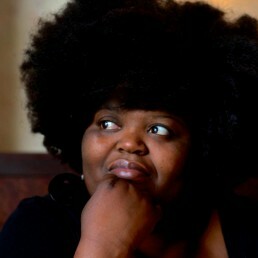 She is an artist, author, poet, curator, disseminator, photographer, activist, workshop facilitator and singer. Too much for a short life? Obviously not! In Lahya’s life almost everything revolves around reality molecules that are lovingly as well as socio-critically strung together, cloaked in singing, photography and/or poetry. Within her lives a black, social disability affected, neurodiverse, emotionally inexhaustible, queer, phat-is-beautiful, multiplesurviving academic, artist and activist with a German passport. A royal, eastern, white and female-socialized, poly-lo_ving cis_femme of middle class, with sufficient financial means, enough hair on her head and a big heart (estate/status/dated: september 2017). She lives in letters and addresses topics like decolonialization, dreams and trauma, self_love, intersectionality, healing, privileges, identiti_es and, especially, warm strawberry ice cream. Stefanie-Lahya Aukongo will be speaking in panel 5: German, BUT with a migration background on 29th October.